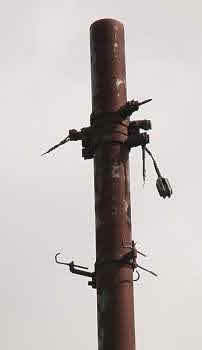 Old Town High Street had an almost complete set of traction poles doubling as lamp standards they can be seen embedded in the high pavement. 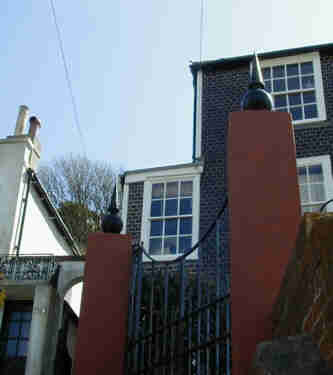 They were removed in November 2001 and on November 12th when the webmaster was given for preservation a finial and lamps from poles opposite the end of Courthouse Street. The traction poles themselves were cut into sections with an angle grinder and, contrary to popular belief, were hollow, being made of steel with approx half inch wall thickness. Converted tram poles in other parts of the town had been filled with concrete to strengthen them to carry the extra weight of the double overhead needed by the Trolleybuses. 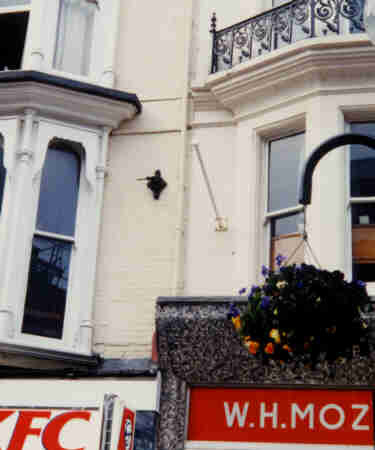 In many parts of the town traction poles were not used at all, the overhead wires were hung from span wires attached to roses on buildings at first floor level, this one on York Buildings, Wellington Place still has part of the span wire attached. 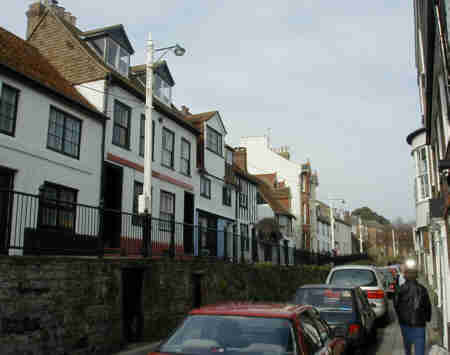 Places where more roses can still be spotted include Roberson Street, Cambridge Gardens and on the seafront from Marine Court to the end of Caves Road. As far as I know the last remaining Hastings or St.Leonards traction pole still "in the wild" is at the Ridge end of Ivyhouse Lane, complete with span wire stays and porcelain insulator! There is a complete traction pole with light etc (not working) opposite the Stables Theatre at the top of High Street, it's a silent reminder of silent, pollution-free transport; unfortunately a leafy tree obscures a lot of it from view. 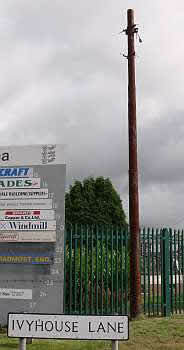 Finials from traction poles recycled as gate posts in Castle Hill Road. The house in the background is faced with Mathematical tiles. 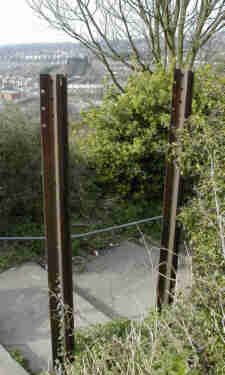 These two tram lines once carried some form of notice board at the top of Mount Pleasant Road on the path to Ore Railway Station. The nearby electricity sub station also uses tram rails as fence posts! 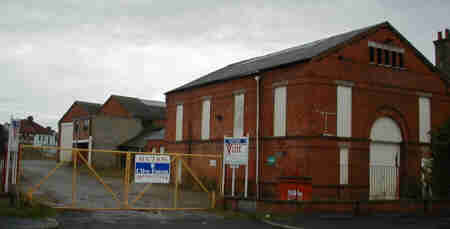 The original Tram Depot on Bexhill Road was known as Bulverhythe Depot Inside the former depot the tramlines are still in place. 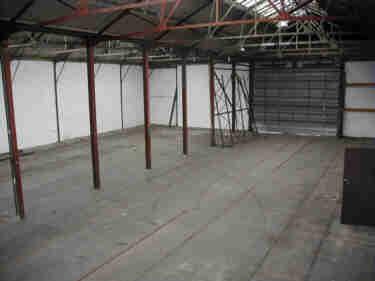 Silverhill Depot, now a Stagecoach Bus Depot, was built as a tram depot, then housed the trolleybuses.